A plan for the playground. Photo supplied. The Hugh Green Group made the donation so extra features could be added. The group is also developing the playground, which is funded by Howick Local Board. Board chair David Collings says a development plan based on ideas submitted by the local community was accepted last year. 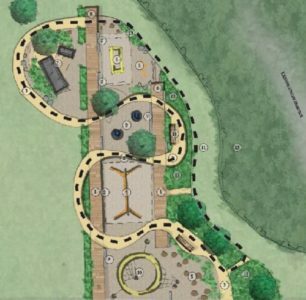 The Hugh Green Group offered the money to increase playground amenities, and the contribution will be marked with a memorial plaque to company founder Hugh Green. “Hugh was a well-known landowner in our area and we are delighted the generosity that was so much a part of his character has been continued in his honour,” Mr Collings says. Mr Green arrived from Ireland and began farming before entering the construction industry. He died in 2012 but his charity work continues today through the Hugh Green Foundation. The donation has allowed a planned footpath to be converted into a balance-bike track with raised humps, providing a space for young children to learn to ride that is also suitable for scooters, trikes, strollers and wheelchair-users. Memorial seating will also be provided.